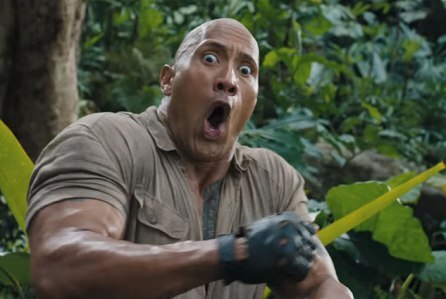 We've already known that a sequel to 2017's Jumanji: Welcome to the Jungle was happening for two reasons. First, it was Sony's highest-grossing movie ever with $962M, so clearly they would want another one. Second, they've already dated it for December 2019. The only thing missing was the official blessing of star Dwayne Johnson, which he has now given on Instagram, of course. Johnson posted that work on Jumanji 3 is "officially underway", having apparently been very impressed by a pitch from returning director Jake Kasdan. He also went ahead and confirmed his co-stars Jack Black, Karen Gillan, Nick Jonas, and Kevin Hart would all be coming back. Previous writers Jeff Pinkner and Scott Rosenberg will return to pen the latest jungle adventure, which Johnson says will kill off Hart's character in the first 15 seconds. Probably a lie but still kinda funny. Guess I should finally sit down and watch the movie, eh?